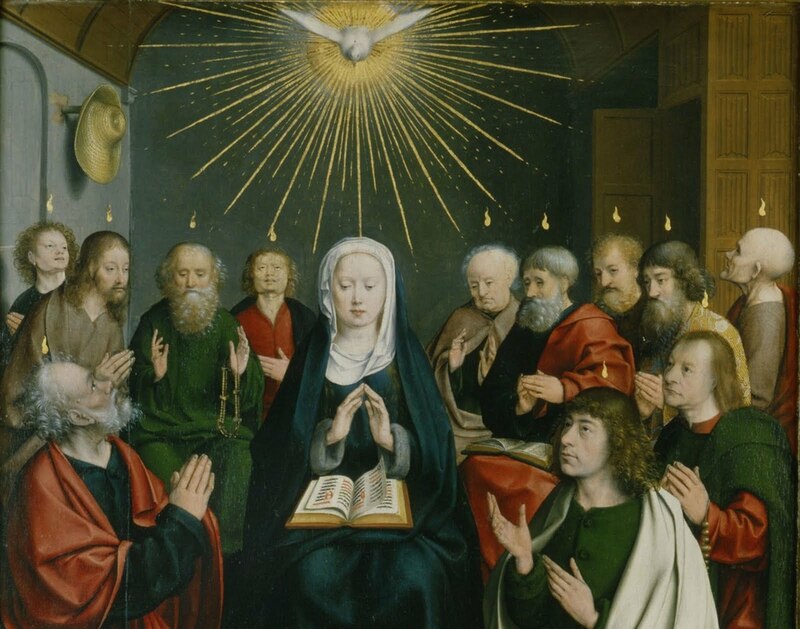 The great feast of Pentecost comes this Sunday. In a sense, there is no more important feast for the Church, for this is when we celebrate what Christ means for us, where the Gospel penetrates our hearts and the life of the Church. Tomorrow, then, we will consider the readings for Sunday. But today we take an additional day to meditate on Pentecost. The Lectionary gives us a nice opportunity to do this, because the Church has chosen many options from Scripture that can be read on Saturday, the Vigil of Pentecost. Let us briefly review them. The great question Pentecost poses is, what are these rivers of living water? What do we drink from the heart of Jesus? What happens within us when we believe in him? The first two Old Testament options answer this question with a vivid contrast, between the tower of Babel and Mount Sinai. The tower of Babel has clear ties to Pentecost. When the Spirit comes at Pentecost, as our reading for Sunday will say, the people from many nations – the reading from Acts lists many nations – proclaim “we hear them speaking in our own tongues of the mighty acts of God.” Whereas at Babel, they were “all speaking the same language” until “the LORD confused the speech of all the world.” The “tongues” of Pentecost undo the punishment of Babel. Where Babel was the beginning of division, Pentecost is the beginning of the nations coming together in the one Church. But why did God confuse their speech? Why did he create division in the first place? We can answer in part by considering literary genres. In Genesis and Exodus, everything that happens, good or bad, comes from the hand of God – even if there are created causes. These books are less concerned to defend God from doing evil than to see how everything is in his hands. We can relax a little, then, about God himself actively mixing up the languages. But the deeper problem is simply that the Babylonians live only for themselves. “Let us build ourselves a city,” they say. God fears that they will do “whatever they presume to do.” A world without God, built only by their own power, and according to their own whims. Contrast this with Mount Sinai. The mountain and the tower are themselves parallels: but one is from the power of man, the other, vastly greater, is from the power of God. Exodus underlines this with “peals of thunder and lightning, and a heavy cloud over the mountain, and a very loud trumpet blast.” In short, God is awesome, vastly more powerful than man. God says, “you have seen for yourselves how I treated the Egyptians, and how I bore you up on eagle wings.” Egypt, like Babel, does everything itself. But the power of God is infinitely greater than Egypt’s, and can rescue his people from Egypt’s tyranny. Pentecost reminds us of precisely this: we are not left as orphans! “Moses led the people out of the camp to meet God . . . at the foot of the mountain.” Here is a people that does not worship itself, but worships God. God calls them to “hearken to my voice and keep my covenant,” to acknowledge him as God. And he will acknowledge them: “you shall be my special possession, dearer to me than all other people.” Babel is turned in on itself; Israel turns upward to God. And God loves them. Thus the means are different (the strength of man vs. the strength of God) and so too are the ends (our own whim vs. relationship with God). This is what the Holy Spirit leads us to, what he enables. The other readings repeat the same themes. Ezekiel asks, “can these bones come to life?” – “these bones are the whole house of Israel.” “Our bones are dried up, our hope is lost, and we are cut off.” But “from the four winds come, O Spirit, and breathe into these slain that they may come to life.” The Spirit is the giver of life, beyond all human hope. In Joel, he gives the gift of prophecy, of spiritual knowledge. In the reading from Romans he teaches us how to pray. This is the Gospel: that from the heart of Jesus flow forth rivers of life-giving water, bringing us beyond hope, back to a loving relationship with our Creator. Is our perspective too earthly? Do we believe in the Holy Spirit?